In a large pot bring 4 quarts of water and 1/3 cup salt to a boil. Add rice and boil for 8 to 10 minutes, till the grains have lengthened and softened enough so that when you test-bite a grain it is no longer crunchy. (Skim foam as necessary, using a spatula.) Drain rice in a colander. Fill pot with a few cups of tepid water and douse over the rice in the colander. (This step helps to de-starch the rice.) Leave to drain. Heat 1 tablespoon of oil till hot, add walnuts, sautee on medium heat for 3-4 minutes. In the final minute, add raisins, sprinkle with a pinch of cinnamon and a pinch of saffron. sautee for one minute along with the walnuts. Set aside. 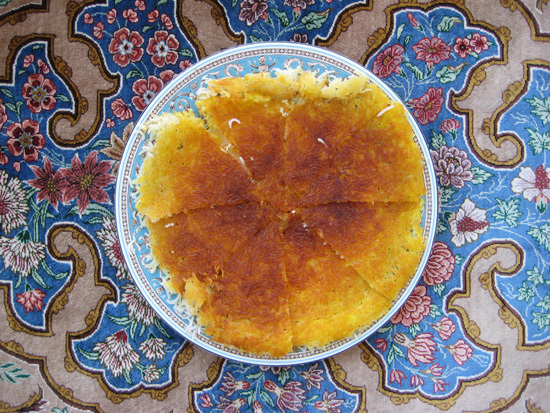 Eat it, enjoy it, and noosh ‘e joon! I am not sure I could pull this one off, but it looks great! Congrats on the NYT Magazine! That’s fantastic! Thank you!!! It’s very easy to pull this off though … come on! Oh look at that beautiful buttery crust – this recipe is really wonderful. I will be giving it a go I doubt though I will be achieve such a wonderful looking dish. Let me know how it turns out Maria joon! OMG, Azita , I never had that one, reminds me a bit of Adas Polow, but without adas, Lol. What an achievement cooking for th N.Y.Times Magazine, I wish I had that issue. You are amazing. Thank you Azita, not a genius, but a food lover! 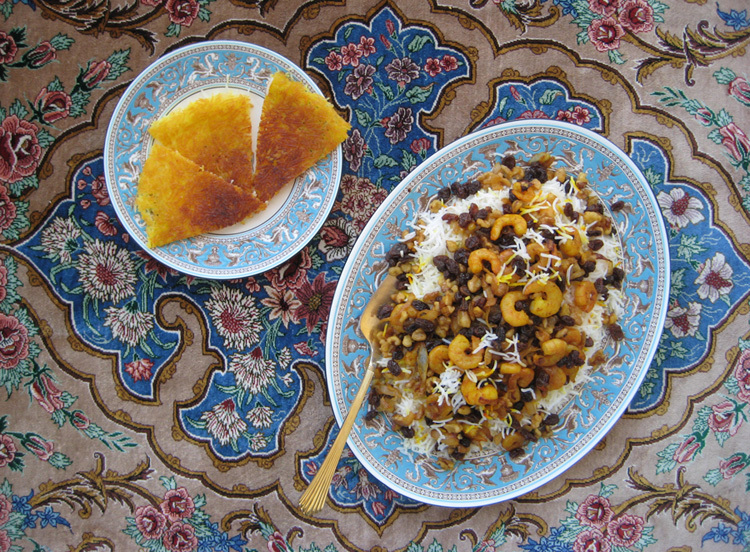 Wow, I absolutely love Persian food, and your rice looks like a dream come true! Congratulations on the feature – it’s looking great! Thank you so much and oh yeah, this rice is dreamy! Kind of lush in the best way 😉 Thanks so much for visiting and commenting! Wow Azita, congratulations. Thats incredible about NYT, great article and love fesenjan, it’s been such a long time since I’ve had. 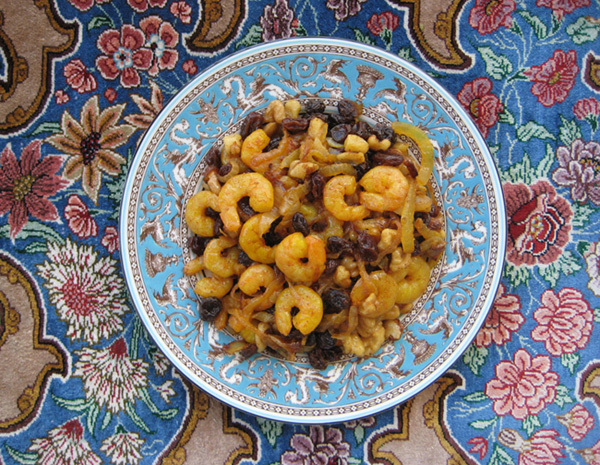 Great pic of you and the family, I have never seen a Persian recipe that uses shrimp. This sounds wonderful. This is one of those dishes that I MUST make ASAP. Never had such a combinatin of ingredients in one plate and my dad is from Shiraz!! It really sounds so good & looks very appetizing. I should make it for him & see his reaction. Thank you. Love the NY times event. The Yalda night has such a romantic/nostalgique notion for me or perhaps all of us Persians so anything relating to it is a happy feeling. Congratulations on the beautiful work you did. Congrats Azita on cooking for the Ny times! And oh, the rice looks delicious! How fabulous Azita – such a great article in the NYT! As always a beautiful feast laid out on the table… fit for Persian Royalty! 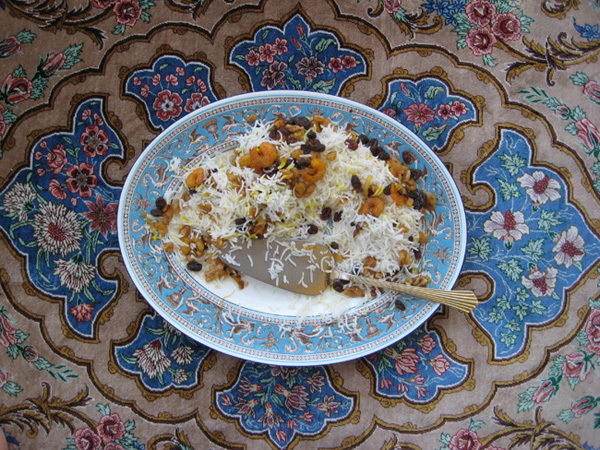 and great to learn a little more about Persian culture. This polo sounds so very delicious too – an eclectic and luxurious mix of ingredients, flavours and textures. Oh, Azita. That is beautiful and you know I’ve been meaning to make a polo for sooooo long, but I’m afraid it takes too much time. I need to make this one. It’s gorgeous. So awesome re; NYT. I love Sam Sifton. Very cool! What a beautiful photo of you with your friends. So great to see. You really are impressive. What a tasty inviting dish! Beautifully presented too! Dearest Laura, thank you for the super sweet comment, really appreciate it. 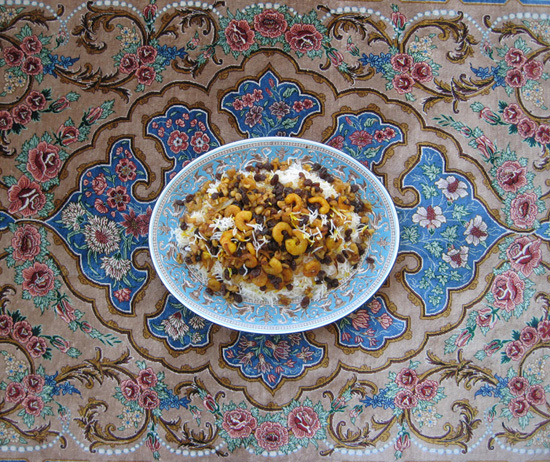 The tablecloth is … a Persian carpet. I wish it was a magical one would fly over and we would cook together and I’d definitely let you use it as a prop BUT I would take it back before it suddenly disappeared! 😉 Hope you’re having a great December as well and Happy Holidays! This dish is new to me and it is brilliant! I stumbled across your glorious blog looking for a pink Persian riff on popcorn to pair with matcha caramel popcorn in a salty-sweet Perso-Japanese mix and for my Hina-matsuri (Girls’ Day) party on Sunday (can’t wait!). I’ll tell you a secret. That is not a tablecloth. It is a very beautiful, silk Persian carpet that was purchased in Tehran (although I’m not sure in which city in Iran it was woven.) I loved the design and colors of it so I used it as the background! Back again to report that the popcorn was a huge success! A-ha! I bought a lovely Qom silk carpet in Esfahan. Hadn’t thought of using it in blog pics! Yours reminds me of the beautiful tiles in the palaces in Shiraz.